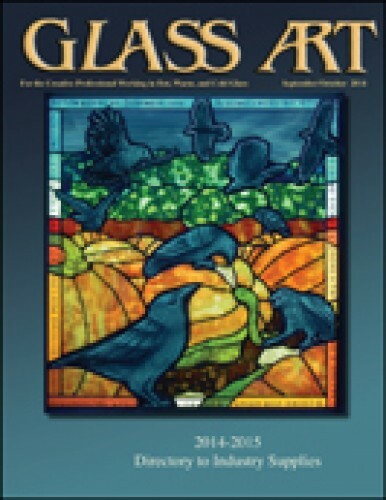 Glass Art editor Shawn Waggoner reminds readers that the annual Directory of Industry Supplies is an indispensible tool for bringing artists and suppliers together. She also introduces the new Master Glass Artisan Lecture Series™ from Glass Art and sister publication, Glass Patterns Quarterly. Preston Studios began creating Tiffany-style lamps done in copper foil, and continue the tradition in all of their current work. Their most recent commission featured stained glass copper foiled panels and windows for a private residence that feature scenes from the beginnings of the printed word. Several members of the Society of American Mosaic Artists (SAMA) shared why they are drawn to the mosaic arts. For many, the appeal of the textures and colors of the materials used to create them provide the challenge of combining the colored tesserae in a way that produces an entirely different color. Hallie Monroe has worked in ceramics, photography, and silk screening. She founded Clear View Stained Glass Works in 1989, and as its sole proprietor, has completed many commissions for businesses and residences, as well as restoration work for churches and public spaces. American Glass Guild (AGG) presented three 2014 awards to leaders in the glass community: the Joe Barnes Lifetime Achievement Award to Peter McGrain; the AGG Inspiration Award for their work with children to Paula Mandel and Joan Myerson Shrager; and received, and the Lifetime Achievement Award in Design to Narcissus Quagliata. Dennis Brady and sons operate four family-owned businesses. DeBrady Glassworks, the main enterprise, builds intricate stained glass model ships for sale through galleries, while Master Artisan develops steel molds and tools, Victorian Art Glass sells tools and supplies, and Glass Campus offers free educational resources for aspiring glass artists. The Stained Glass Association of America (SGAA) took a break from its usual conference format to offer its members an Artists' Retreat at The Elms resort. Six different classes for certification were offered during the morning, with afternoons and evenings filled with many different interactive programs. Gil Reynolds's recent commission to create a residential commission to decorate a large blank wall of a couple's home required detailed planning to guarantee success. The finished project included fused panels, metal art, and designs inspired by the home's surrounding Central Oregon mountain landscape. Charles Correll's career as a hot glass artist helps him know what artisans require of their furnaces. Adapting industrial techniques to the small-scale studio, he designed and built his first recuperative glass furnace in 1980. When not working on efficient hot shop equipment, he continues to create goblets and private commissions. Using relevant keywords to describe a business on a website helps to increase online search engine rankings. It is important to include words that identify the owner and the business in a personal way and to research which keywords are important by poling new and current customers.